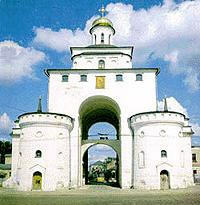 The Golden Gate is a remarkable monument of the twelfth - century architecture. It was erected in 1164 when the building of ramparts around New City was finished. It is probably the only remaining specimen of such fine quality of old Russian military architecture. The repairs gradually altered the Gate's appearance. You will be picked up at your hotel in the morning for the drive to Vladimir. Visit to The Uspensky and Dmitriyevsky Cathedrals. Visit the Golden Gate and its musem. Visit the museum of crystal and lacquer miniatures. The outdoor museum of traditional wooden architecture featuring some fine examples of classic Russian "log cabin" building style. The Savior Transfiguration Cathedral and "mini" bell concert.